Give Yourself A Try was not a good comeback single. 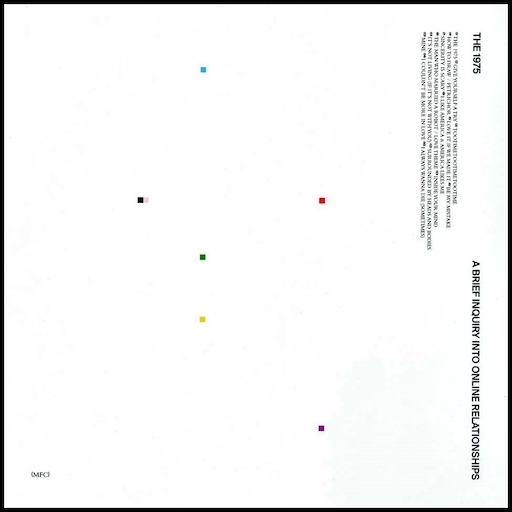 Two years after the release of The 1975's seminal, near perfect pop-rock second album, this new single was a disappointment. Its two note riff, repeated infinitely, is incessant. It's harmonically stagnant. Musically at least, the song goes nowhere. Lyrically though there's more going on. While it initially seems to be about nostalgia, its repeated chorus mantra of "give yourself a try" seems aimed more at lead singer Matty Healy himself than anyone else. He's been open in public about dealing with substance abuse, which lends this song a great deal of catharsis, almost begging himself to clean up his act. In the context of the album, Give Yourself A Try makes a lot more sense and acts as the perfect gateway to this new album with all its strengths and flaws. Lyrically it probes into Healy's own addictions and issues with modern society. Yet musically its songs are monotonous and simplistic, or rambling and insular, and too often border on the pretentious. TOOTIMETOOTIMETOOTIME is an upbeat song about infidelity that has proven to be the most radio friendly of the album's singles, but it too is musically on one level that goes nowhere. Inside Your Mind similarly features an irritating two note guitar riff. And closer I Always Wanna Die (Sometimes) centres on the most banal acoustic guitar chord sequence, its apparently cinematic feel ripped straight from an Oasis song (not a compliment). Yet where the album is in part too simple, in others it's overly experimental. How To Draw/Petrichor is an extension of a previous bonus track that meanders along like a Radiohead knock-off with glitchy beats and wafting orchestrations; Sincerity Is Scary has an improvised jazz influence to match Healy verbosely going on about postmodernism and irony; The Man Who Married A Robot / Love Theme takes monotony to the extreme with a story spoken in a robotic voice about the dangers of the Internet. Across the album vocoders rub shoulders with acoustic guitars, electronics and orchestrations. But it mainly feels overblown, the profundity Healy seemingly shows in interviews not always translating to the songs themselves. Moreover, there are too many ballads as Healy turns from Radiohead, through James Blake and Damien Rice to Morissey. Tracks like Be My Mistake, Inside Your Mind and Surrounded By Heads And Bodies are long and dreary to the point of being morose. And while these songs deal with interesting modern subjects like rehab, impenetrable thoughts and the guilt of a meaningless hookup, it turns the album into an endless slog. And it doesn't have to be. This is a frustrating album with moments of pure brilliance overwhelmed by tonal shifts and dreary pretentiousness, moments where social conscience and musical production align. I Like America & America Likes Me is a song against the use of guns, Healy singing "I'm scared of dying" in a mournful vocoder as if his voice is stifled against the noise. It's Not Living (If It's Not With You) is a fun, hook-laden pop rock song that harks back to the band's best, until you realise it's not an ode to a lover but the drugs Healy is so desperately trying to overcome. It's a heart-wrenching twist to a smart pop song. The album's crowning achievement though is Love It If We Made It. While the verses follow another one-note melody, here it feels more intentional, a stream of (social) consciousness. And then in the chorus it gives way to this widescreen moment of glorious euphoria where the tightly coiled music stretches its celestial wings as Healy sings the album's simplest yet most loaded lyric: "I'd love it if we made it." It's a moment of pure hope, of pop brilliance. If only the whole album was the same. Listen: 'A Brief Inquiry Into Online Relationships' is out now.